Decide on your filling and fill the sandwiches accordingly. Simple fillings are best. Ham and cucumber, cheese and tomatoe or tuna mayonnaise are good ideas. Once you have made the sandwiches, slice off the crusts. Then cut each sandwiches into 4 triangles. Cut the cherry tomatoes in half. Next place one on the top of each sandwich triangle so the flat side is facing down. Now make the sails for your boats. Slice the cucumber into long strips by cutting it at an angle and then skewer the ends of each slice onto a cocktail stick. Attach the cocktail stick by sticking it into the cherry tomatoe. Do the same with the salami sails. If the slices of salami are big you can halve them or you can use slightly smaller slices. Either way works fine. Next place on a serving platter and you’re ready to go. 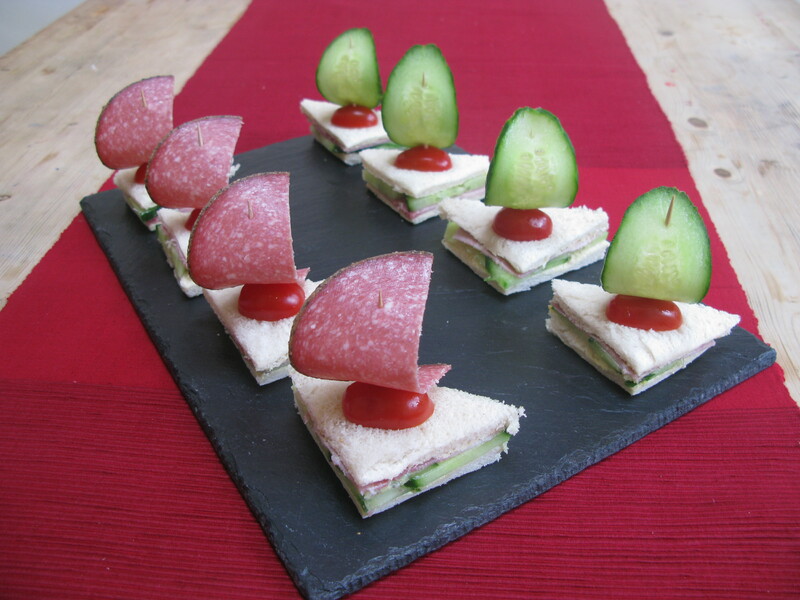 You might also like to try using thin cheese slices to make the sails as well. This blog was written by Froggle parties – childrens entertainers in Surrey, London, and all the home counites.